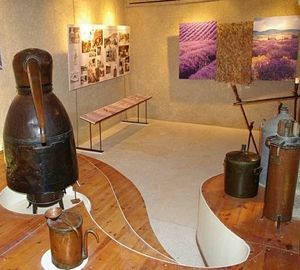 Lavender essential oil distillation equipment in a French museum. The use of aromatic oils goes back to the ancient Egyptians, Indians, Chinese, Romans, and Greeks. However, the modern history of aromatherapy dates to the 1920s, when French cosmetic chemist René-Maurice Gattefossé originated the term "aromatherapy." Before the 20th century, essential oils were commonly called volatile aromatic oils. These oils were part of the embalming process used by the Egyptians, who are believed to have invented a simple oil distillation machine. Evidence also indicates that crude distillation was done in India, where aromatic oils were part of the practice of Ayurveda. However, the primary way of making aromatic oils in ancient times was enfleurage. Enfleurage involves placing flower petals and other fragrant plant parts into a solid odorless fat in a glass jar. The jar sets in the sun until the fat absorbs the fragrance. Then fabric is used as a filter to separate the solid materials from the aromatic oii. Distillation took a step forward in the 11th century with the invention of a coiled cooling pipe by a Persian physician named Avicenna. The coiled pipe let the plant vapor and steam cool more effectively than the straight pipes previously used. Distillation likely didn't become common until the late 1500s. At first, it was mostly used to produce scented waters, according to The Essential Oils, Volume 1: History—Origin in Plants, Production—Analysis by Ernest Guenther, Ph.D. 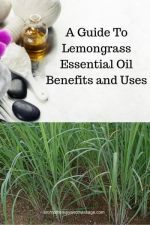 The book also states that in the 1600s and 1700s pharmacists were the primary distillers of essential oils, and in the 1800s, the use of essential oils in medicinal drugs gradually became subordinate to their use in producing perfumes, beverages, and foods. See Guenther's book, or Eduard Gildemeister's The Volatile Oils, Volume 1, Second Edition, for many more details about the history of volatile oils. René-Maurice Gattefossé worked as a French cosmetic chemist in the early 1900s. The commonly told story is that in 1910 Gattefossé badly burned his arm in his lab and plunged the arm into a vat of lavender essential oil. The burn healed so quickly that Gattefossé spent the rest of his life studying essential oils. However, as aromatherapy expert Robert Tisserand wrote in a blog post, Gattefossé’s Burn, who leaves an open vat of essential oil lying around? The truth is a bit less dramatic. Gattefossé did burn his arm, but he later intentionally applied the lavender essential oil, and it stopped the spread of gangrene. He did spend his life studying essential oils and wrote the first modern aromatherapy book, titled Gattefosse's Aromatherapy in the English translation. If you want to know more about Gattefossé, view this documentary on YouTube about him and the early history of aromatherapy. A French doctor named Jean Valnet followed the work of Gattefossé. During World War II, when Valnet ran out of antibiotics, he used essential oils to treat gangrene and battle wounds. After the war, Valnet continued to use essential oils to treat illnesses and wrote The Practice of Aromatherapy: A Classic Compendium of Plant Medicines and Their Healing Properties, which was translated into English by Robert Tisserand. Another pioneer in the history of aromatherapy was Marguerite Maury (1895-1968). Maury was an Austrian-born biochemist who, while living in France, researched the effects of essential oils on the nervous system and on the well-being of people. Marguerite Maury's Guide to Aromatherapy: The Secret of Life and Youth was first published in French in 1961 and then published in Britain in English in 1964. In the 1970s, Tisserand wrote and published The Art of Aromatherapy: The Healing and Beautifying Properties of the Essential Oils of Flowers and Herbs, which was the first aromatherapy book initially written in English. Since the 1970s, the practice of aromatherapy and using essential oils has proliferated. Tisserand remains an expert in the field, and in 2013 published the second edition of Essential Oil Safety, a comprehensive look at the research around essential oils. 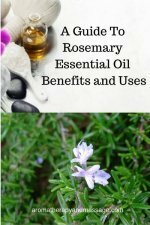 Today, essential oils and aromatherapy information are widely available. Not all that information is reliable or takes into account that something safe for 99 percent of people can harm the other one percent. 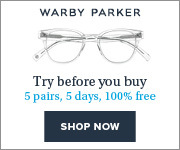 "Experts" have varying opinions. Learn all you can and use your good judgement in deciding how you want to use essential oils.